I think empties are my favorite type of post to do and see other people do. I love knowing which products are worth spending money on and which ones aren't. Here are all the products I finished up this past month. I have been loving Tide Pods except for the child-proof ziploc container. I swear this bag is Melissa-proof because I end up just ripping the bag open most of the time. Softsoap lavender and chamomile is just okay. I'm not super picky about my soap and this I managed to pick up while couponing so you know that I didn't pay much for it! Bounce dryer sheets are great and the only dryer sheets that I will use. I will keep purchasing them in the future. I'm still using the Dawn dish soap in the New Zealand scent which is a beautiful teal color. I keep choosing this one because it looks pretty on my sink and smells great! I love using these little Gain vent clips in my car and this one smells great and just like laundry! I've already picked up another. These Lysol wipes in the purple container aren't my favorite they don't smell great and I'm glad to get back to the yellow and green container wipes. I finished a container of bleach which I use once a week when I do a load of whites. I'm not picky with where my bleach comes from it's all the same! I used up a container of Purex which I like but it's something I grew up using. I do feel Tide works a little better and I do like pods better then carrying a bottle of detergent either downstairs or to the laundromat. Lastly for household products I used a Method Bathroom Spray which I think is just okay. I will be trying some other bathroom cleaning products in the future! I finished two candle this month and I liked both of them a lot. The Bath and Body Works candle in Mahogany Coconut was really nice and had a musty scent to it. The coconut candle is something I received as a gift and I have a second one I'm currently burning right now. I thought it was a really cool concept but didn't last very long and also didn't have much of a scent. I thought the da Bomb Party Bomb was very cool and the company seems to be run by two teenage girls which is awesome! There was a tiny little dinosaur inside which was cute and the pineapple scent was great. I would definitely try other bath bombs from this line. Bath and Body Works Aruba Coconut shower gel is great and even Tim used it! I love anything coconut scented and this was no exception. I used the Olay moisturizer regularly and thought it was great for my sensitive skin. I am going to try some other things but I would definitely consider buying this in the future. I love that it's a small container with a pump since it's a little more sanitary then a container you dip your fingers into! I used up four cake batter chapsticks. That's not a lot for me at all which is great because I tend to fly through these! I almost finished a pack of Pacifica face wipes but they ended up drying up before I could use them all. They were okay and took off the majority of my makeup and did not burn my eyes at all which is good. I may repurchase them in the future but I didn't find them amazing or anything. I really liked the Make eye makeup remover and would consider purchasing it in the future. I have quite a few other eye makeup removers to try right now though so I'm not planning on buying anything soon. I purchased this Pacifica mascara when I bought the wipes and thought it was just okay. The wand was super thick and not what I prefer to put on mascara with. I don't think I'll be repurchasing this in the future although I did like it was a natural makeup product. 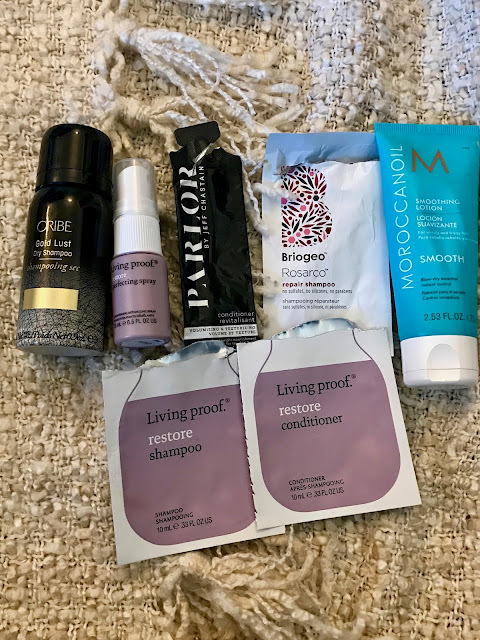 Quite a few hair products this month! The Living Proof Shampoo and Conditioner was just okay, nothing too special. I did love the Living Proof Restore Spray which I used as a heat protectant. It smelled great and I thought my hair looked great! The Briogeo Shampoo and Parlor Conditioner I used at the same time and they were both just okay. I won't be purchasing full sizes of them and were happy to just get them out of my collection quite honestly. A product I will definitely repurchase is the Moroccanoil Smoothing Cream. I received this for Christmas and it was awesome. I love Moroccanoil products and I will definitely be getting more of them in the future. Only one mini lotion this month. 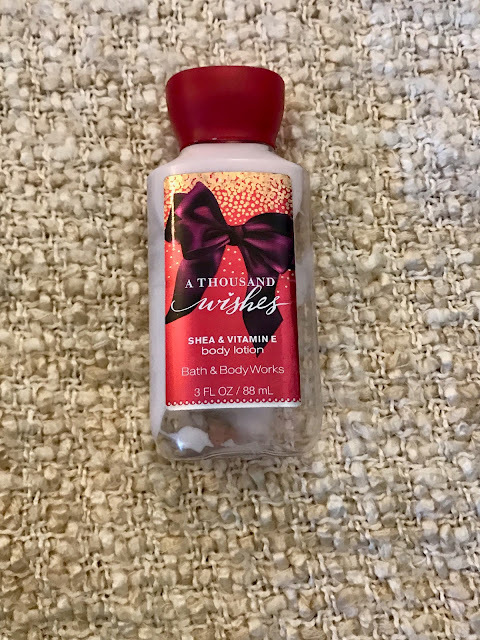 I loved Bath and Body Works A Thousand Wishes! This scent was great and I kept it in my drawer at work which made a lot of people want to use it! I received a lot of compliments on how nice it was so I will definitely be repurchasing this in the future! The one declutter item I had this month was Avene cleanance gel which had expired back in February. I decided not to mess with this since I don't want to put any expired products on my face! That's it for this month's empties! I'll see you guys later this week with my next post!